Introducing a new dog to other dogs, children, or other pets depends on keeping control of the situation and making sure that everyone feels safe and comfortable. Introducing a new dog to the household can be stressful and even dangerous if it isn’t handled right. Every dog trainer knows that the best way to stop dog aggression is before it begins is by introducing a new dog to other pets and family members properly. Whether they’re going to be living in the same home or simply visiting, the best way to introduce strange dogs is outside or in another neutral territory. 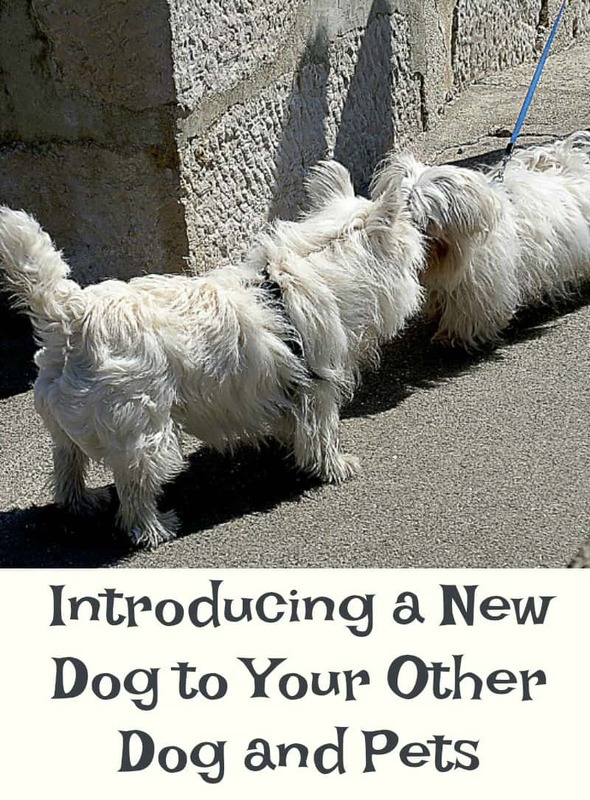 Some dogs will get upset if a new dog is brought into their home or yard, so meeting elsewhere helps to ease the transition and makes it likelier that they will get along. If one of the dogs has an unknown past (like a shelter dog adoption) or a history of dog aggression, it’s best to walk the dogs past each other at a distance, firmly in hand on leashes, for a few minutes. Gradually bring the dogs closer until they are passing each other, then (if both are well-behaved) allow them to meet on leash at first. Once dogs are comfortable together outside, it’s usually safe to bring them inside. But remember to keep a close watch on them for the first few days or weeks, until they are used to each other’s presence. It’s smart to walk new dogs around the house on leash at first to teach them that the home is yours and that they must listen and obey inside the house. Depending on the size and layout of the home, it may make sense to keep all dogs on leash at first, so that those who have lived there longer don’t descend on the newcomer and overwhelm him or her. 1) It’s not a good idea to leave strange dogs together unsupervised at first, so a crate or separate sleeping rooms are a good idea in the first few days or weeks. Crating one dog and allowing the other to stay loose in the same room provides both dogs with company, safely. 2) Be prepared to separate the dogs if play becomes too active or if one starts growling. This kind of behavior is normal at first, but it’s important for the person in charge to intervene and establish that humans, not dogs, are in charge of the house and must be listened to. 3) Read up on dog psychology in advance. Dogs won’t fight once they accept that their human family members are dominant and begin to feel comfortable with their place in the “pack.” Learn more about training using dog psychology. It’s crucial to introduce a dog properly not only to dogs, but to cats, other pets, and younger family members, as well. The new dog needs to respect even young children as being higher in the “pack structure” of the family and has to recognize that infants, toddlers, and any small pets like cats or rodents “belong” to the adults in the pack and are under human protection. The key here is to go slowly. First, allow the new dog to smell the toddler, cat, or other pet through a closed door. If the dog growls or becomes frantic, correct them calmly but sharply until they are able to sniff at the scent without an aggressive reaction. If they do not respond to corrections, consider that this may not be an ideal dog for your household. After a day or two of coexisting behind closed doors, gradually introduce them by bringing the dog on a leash into the same room with the cat (or hamsters, birds, baby). Again, watch closely and correct sternly if the dog does not behave politely. These first introductions are very important and the dog must understand that the toddler or small animal is under the protection of the adults who run the household. Most dogs will be gentle and well-behaved; in which case, you can progress in a few days to allowing them to be around other pets without the leash. Remember, though, that constant supervision is important with every dog! No matter how well a dog behaves around toddlers or cats, it’s always best to keep them separate for their own safety when not under direct adult supervision. These are great tips. Introducing a new pet can be tricky!